A recent poll revealed that many have a negative attitude towards the lower house or parliament and are in favor of its abolition. According to a poll by the Levada Center, the majority of Russians oppose the work of the current State Duma deputies, with more than 90 percent admitting they do not know or only have a "vague idea" about their accomplishments. The number of people who would prefer a government by presidential decree and the abolition of the State Duma exceeded the number of the supporters of the lower house. Experts explain this trend by pointing out there is a lack of objective information about the work of deputies, in addition to the fact that the executive power exerts a significant influence on them. 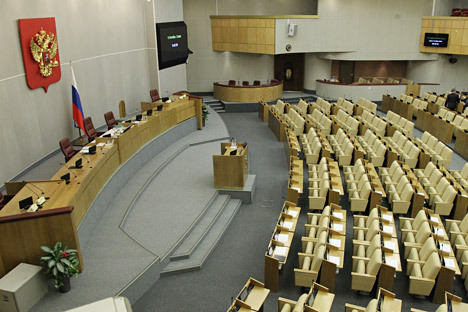 The Russian parliament consists of two chambers: the State Duma and the Federation Council. The State Duma adopts laws, while the Federation Council approves or vetoes them. The 450 deputies sitting in the State Duma are elected from party lists, while two representatives from each of the 83 regions of Russia constitute the Federation Council. Deputies, members of the Federation Council, the president, the government, regional parliaments, the main Russian courts (the Constitutional, Supreme and Supreme Arbitration courts) may introduce laws for consideration of the State Duma. Most bills, however, are introduced by Duma deputies. At the beginning of September 2013, out of 1704 bills pending in the State Duma, 836 were introduced by deputies. They were followed by regional parliaments with 455 bills, members of the Federation Council with 183 and the government with 181. 34 bills were submitted by the Supreme Court, 15 by the Supreme Arbitration Court, and none by the Constitutional Court. In the past spring session, which lasted from January to July, the State Duma set a record for number of bills under consideration (639), approving 261 of them. This is slightly less than the amount of bills approved in 2012 (338 adopted laws) and more than the total of bills (223) passed by the State Duma during his second session (1995-1999). Bills introduced by the president of the government are usually approved rather quickly. Currently four parties sit in the Duma, with the highest number of parliamentary seats being occupied by the ruling party "United Russia." The minority is represented by the Communist Party of the Russian Federation, the social democratic party Just Russia and the Liberal Democratic Party of Russia. When asked whether Russians need the State Duma or "the life of the country can be equally well organized in accordance with the decrees of the president," the majority of respondents (43 percent) answered that the will of the president is enough. Front for a New Perestroika? Another 39 percent of respondents said that the country needs a lower house of parliament and 18 percent were undecided. It is worth noting that from August 2011 the preferences of the Russian population appear to have changed - at the time 47 percent sided with the State Duma and only 32 percent believed the decrees of the President to be enough for the government to function efficiently. According to the deputy director of the Levada Center Alexei Grazhdankin, Russians see decisions made by the executive as having a much stronger impact than those made by the legislative power. Moreover, most citizens assess negatively the activities of the deputies over the past two years. 36 percent of the respondents declared themselves "rather against" their work and 20 percent "strongly opposed" them. Only 14 percent and 2 percent respectively were said to have a “rather positive” or an "entirely positive" attitude towards them. Almost a third of respondents (29 percent) were undecided. The majority of respondents (51 percent) have a "vague idea" of what the work of the deputies over the past two years consisted in, while 40 percent admitted to know nothing about it. Political scientist Ilya Konstantinov confirms the interpretation according to which the current Russian parliament is completely subordinate to the executive power and becoming superfluous. "I believe that in its current form the Russian parliament is not needed: it is just an institution that stamps bills written by the presidential administration and the government. People understand this very well. Initiatives started by the parliamentarians themselves often have an despicable character,” he says. “Such a State Duma results in a form of managed democracy, with elections becoming a mere formality and deputies getting appointed based on their loyalty and predisposition to servility." Iosif Diskin, deputy chairman of the All-Russian Public Opinion Research Center, however, offers a different reading. He is convinced that the negative assessment of the State Duma has developed due to the lack of coverage of the operations of the parliament. "People do not understand the connection between their life and the laws adopted in the State Duma. Out of all official figures, Russians are mostly interested in the president’s actions. And this is because presidential structures explain well what they are doing and thus maintain high ratings,” he says.